Proper infection control is important to everyone’s safety including the staff, the doctor and patients. We use protective personal equipment (PPE) like disposable gloves, face masks and eye gear to reduce spread of germs. Protective personal equipment work to protect both patients and staff from cross contamination. Once needles are used, they are properly disposed in designated sharps containers. We also practice aseptic injection techniques which minimizes needle pricks. You will notice that we place disposable protective barriers on all surfaces which come into contact with patients. Barriers are switched between patients and prevent cross contamination of germs. We clean our office daily and clean up each room in between patients. Plus, we purge and flush water lines at the beginning of each day and in-between patients. This helps flush out our water system to prevent cross contamination. 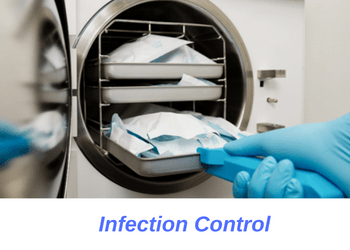 One of the most important steps in maintaining infection control is disinfecting and sterilizing critical and semi-critical equipment. We autoclave all reusable instruments after each use. Plus, we test our autoclave device weekly through performing biological spore test. We use the ConFirm biological monitoring system to verify spore test results. Equipment which are not eligible for sterilization are cleaned using cold sterilization or surface disinfectants. We use Glutaraldehyde hospital grade disinfection solution to clean these instruments. Disposable equipment, such as suction, barriers and guaze, are discarded after each and every use. For each patient we use a brand new set of suction, spray, tray cover, barrier, etc. Any disposable item that is touched will be discarded afterwards, regardless of whether it was used or not. As you can see, we take your health and safety very seriously. After all, by protecting you from cross contamination we also protect ourselves. If you have questions about our infection control protocol please contact us via email. We will be happy to provide you with a copy of our office infection control protocol upon request.